Many of you might know October as Breast Cancer Awareness month (more on products honoring the month soon!). But if ya don’t know, it’s also National Bullying Awareness month. Tanda (the brand best known for bringing beauty technology home, from acne treatments to anti-aging devices) has introduced their limited-edition blue zap acne spot treatment device to support the national anti-bullying awareness organization, STOMP Out Bullying. The Zap, if you’re not familiar, uses a trio light, heat and vibration and is clinically proven to eliminate acne bacteria and clear or fade blemishes within 24-hours. It’s blue LED light technology is gentle — just click the orange button and it vibrates for 2 minutes over the affected area to kill bacteria (it’s recommended to repeat 3 times daily!). With every limited edition blue Zap sold ($49), a portion of profits will be donated to STOMP Out Bullying. But you can also get involved by “liking” Tanda’s Facebook page to activate a donation to the organization. Even more, the brand also launched a new contest where you can submit a picture of who you think should be “Tanda’s Next Top Role Model” and why. The role model photo that receives the most “votes” will win the grand prize – a signed Zap from Twilight’s Amadou Ly and a $1,000 donation in their name and in the name of their role model to anti-bullying efforts across the country. There are also other great prizes for runner ups! 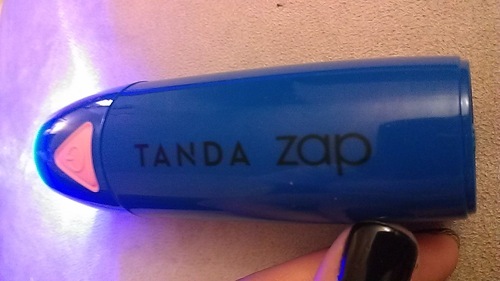 As a recent Tanda ZAP user– I must say, I’m a believer!! It normally takes more than a month for the cystic acne i get on my chin to vanish– with this- less than the week 75% gone! – Have you tried the full version? ?